Theodora Winton Youmans (1863-1932) was the first Wisconsin-born leader and last president of the Wisconsin Woman Suffrage Association (WWSA), which she reorganized as the Wisconsin League of Women Voters. She led lobbying to win the state’s historic first ratification of the Nineteenth Amendment. A prominent journalist, she joined the Waukesha Freeman in the 1880s and became associate editor upon marrying publisher and editor Henry Mott Youmans in 1889. Not until the next century did she become involved in suffragism—but as a clubwoman. In 1900, as Wisconsin Federation of Women’s Clubs (WFWC) president, she led legislative lobbying to win limited “school suffrage” in the state in 1901. In 1911, she declared herself a suffragist and led publicity by a new Political Equality League (PEL) for a second statewide suffrage referendum at the polls. The first referendum had won approval by Wisconsin men in 1886, but a subsequent law had been challenged, and the state Supreme Court had overturned it and returned it to the legislature—where it languished until clubwomen’s campaign for limited suffrage. In the 1912 referendum for full woman suffrage, Wisconsin men reversed the previous results and resoundingly voted it down, two to one. In the aftermath, the PEL merged with the WWSA, which elected her as president in 1913. In 1919, she won state legislators’ ratification of the federal amendment and reorganized the WWSA—meeting in Milwaukee—as the state League of Women Voters, serving as its vice-president and entering electoral politics. A political appointee since 1905 to the Board of Regents of State Normal Schools, she was an alternate delegate to the 1920 national Republican convention and ran in 1922 for state senate, the first woman to run for Wisconsin’s legislature. She served on the Board of Curators of the state historical society, publisher of her history of the state suffrage movement. Upon her husband’s death in 1931, she served as the Waukesha Freeman publisher to her death, when the WFWC established its highest award, for citizenship, in her name. ^ Genevieve G. McBride, On Wisconsin Women: Working for Their Rights from Settlement to Suffrage (Madison: University of Wisconsin Press, 1994), 141, 290-91. She was born in Prospect Hill, now in New Berlin. The Winton family homestead and store, moved for preservation from the original site at W19485 National Avenue, now are part of a historical park. See New Berlin Historical Society website, last accessed July 26, 2017. ^ Genevieve G. McBride, “Theodora Winton Youmans and the Wisconsin Woman Movement,” Wisconsin Magazine of History 71, no. 4 (Summer 1988), 243-75. ^ McBride, On Wisconsin Women, 295, 299-300. ^ Theodora W. Youmans, “How Wisconsin Women Won the Ballot,” Wisconsin Magazine of History 5, no. 1 (1921): 3-33. For another version, see Theodora W. Youmans, “Wisconsin,” in History of Woman Suffrage, Vol. 6, ed. Ida Husted Harper (New York: National American Woman Suffrage Association, 1922), 699-708. She originally researched her history of the state suffrage movement—too self-effacing in her emphasis on predecessor presidents and others, with whom she conducted oral histories, and too reliant on her immediate WWSA predecessor for its history in the late nineteenth century—for her final presidential address to the WWSA at its last annual convention, in Milwaukee in 1919, when she first had published her history of the state movement as a newspaper article in her Waukesha Freeman column; see also a draft in the Henry M. Youmans Papers in the Wisconsin Historical Society Archives in Madison—as are many of her papers, although incorrectly or at least unfortunately catalogued under his name, not hers. ^ “Youmans Dies,” Waukesha Freeman, August 18, 1932. ^ McBride, On Wisconsin Women, 301. 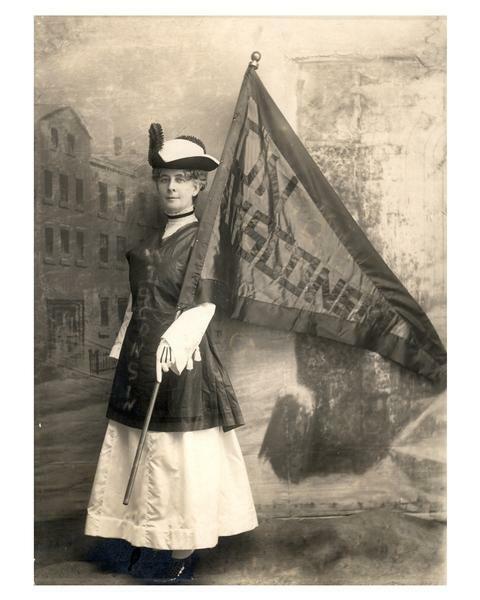 McBride, Genevieve G. On Wisconsin Women: Working for Their Rights from Settlement to Suffrage. Madison, WI: University of Wisconsin Press, 1994. McBride, Genevieve G. “Theodora Winton Youmans and the Wisconsin Woman Movement.” Wisconsin Magazine of History 71, no. 4 (Summer 1988): 243-275. Youmans, Theodora W. “How Wisconsin Women Won the Ballot.” Wisconsin Magazine of History 5, no. 1 (1921): 3-33. Youmans, Theodora W. “Wisconsin.” In History of Woman Suffrage, vol. 6, edited by Ida Husted Harper, 699-708. New York, NY: National American Woman Suffrage Association, 1922.